Our beautiful, modern lodge offers you luxury self-catering accommodation in a quiet yet convenient setting. The spacious layout is bright and airy and offers two en suite bedrooms, sleeping up to four people. The living areas have laminate flooring and rugs, whilst the bedrooms are fully carpeted. The beds are hotel quality and super comfortable, dressed with pure white luxury linens. All towels are provided, but please bring your own towels for the beach. 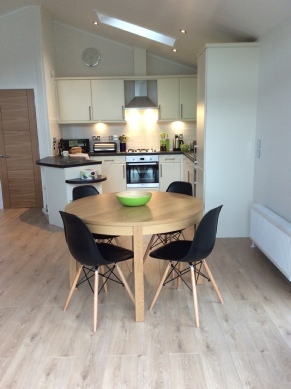 Kitchen area: Electric oven and gas hob, fridge/freezer, wine cooler, dishwasher, microwave, washing machine and all the crockery, cutlery, glassware and cooking utensils you will need. Dining area: Extending dining table with seating for four people. From here bi-fold doors open out onto a large raised deck with patio dining furniture. The deck is perfectly positioned for plenty of afternoon and evening sun - ideal to enjoy al fresco meals. Living area: Two comfortable sofas, easy chair, coffee table, side table & shelving. Feature electric fire, wall mounted smart TV with Freesat and a DVD player. Master bedroom: King sized bed, wall mounted cupboards, bedside drawers and a walk-in wardrobe area with lots of hanging space. Hairdryer provided. 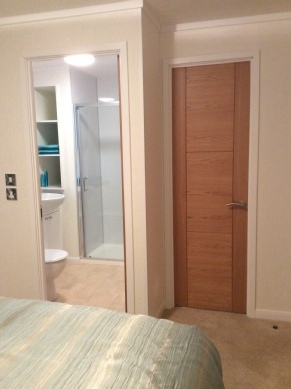 En-suite: Large shower cubicle, WC, hand basin and heated towel rail. Bedroom Two: Double bed, wall mounted cupboards, bedside cabinets and a double wardrobe. Hairdryer provided. En-suite Two: Full sized bath with shower over, WC and hand basin. The lodge is warm and cosy whatever the time of year, with full gas central heating and a feature electric fire.